On April 26, 2016, Malik Riaz held an open meeting at the Grand Hotel in Bahria Town. Attendees included Bahia Town dealers, investors, and affectees of Sector F, Golf View Residencia, Bahria Greens, and various blocks of Bahria Town proper. Malik Riaz flew down from Dubai to attend this meeting, which was announced during his last talks with the affectees about a month ago. Without any prior official announcement, around 500 people showed up to attend this event. Individual investors were given a chance to communicate directly with Riaz, who spoke frankly – and, at times, quite humorously – with them. Most of the attendants had issues such as unnecessary delays and hurdles caused by the Bahria Town management. Riaz reacted firmly and immediately ordered his staff to fix the issues as soon as possible. A sizeable percentage of attendees were investors of Golf View Residencia, the development status of which still isn’t clear. Riaz told these file owners not to not pay any instalment as the project is facing delays. He said that Bahria Town would let them know about initiation of development work in Residencia and that is when they should resume paying instalments. Not paying instalments right now would not result in a fine, he assured. Riaz said he was just waiting for a couple of issues to be fixed and that development might begin in 25 days. He also announced that Bahria Town has acquired all the needed land for this project, which will soon be connected with Raiwind Road. The concerns of Bahria Green file owners were also duly addressed by Riaz. He signed the applications of various owners at the event and also approved 100% cash refunds for those who wanted them, something Bahria Town has never done in the past. Bahria Town has held two rounds of balloting to adjust the relocated affectees of Bahria Town but none of these ballots have included files with pending payments. In this regard, a notification was issued by Bahria Town earlier this month requesting file owners to clear their dues in order to be part of the ballot scheduled for May 30, 2016. However, Riaz announced yesterday that he will hold the balloting of 200 plots in Talha Block, Bahria Town Lahore on April 27, 2016 at 5pm to adjust Sector F file owners. This ballot will only include the files with all dues cleared and plot numbers allotted. To the surprise and pleasure of the attendants, Riaz announced that a particular complainant who was angry at the unprofessional attitude of personnel at the Bahria Town office in Lahore will do the ballot. The ballot will be done for 5-marla, 10-marla and 1-kanal plots in Sector F. Those who remain unsuccessful in this ballot will get their plots in 4 months anyway – at least that’s what Malik Riaz said yesterday. This meeting was just like any other open court, where keeping decorum was somewhat hard as the attendants had spent many tiring years trying to get their property-related matters fixed. But Malik Riaz remained calm and patient, his body language and responses reflected positivity and confidence. He also requested the attendants to drop their numbers and promised to reach out to them individually. According to my sources, many folks did indeed hear from Malik Riaz today. He inquired about their issues and promised to look into the matters in great detail. He also promised to contact them again in a few days. The folks with plots facing litigation in Bahria Town’s Blocks DD and EE can also breathe easy, as according to Riaz they will get their plots in one month. A common complaint among attendees was the poor attitude of Bahria office personnel, who, in some cases, even refused to attend to applications signed by Riaz himself. 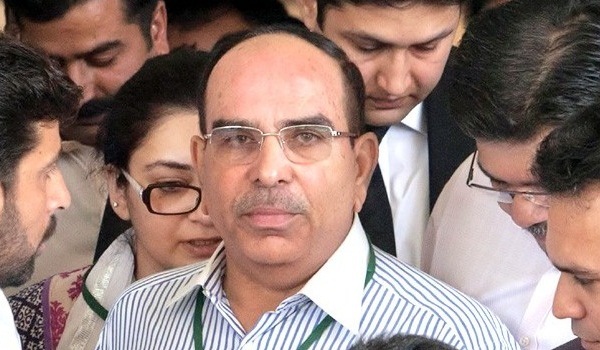 To fix this, Malik Riaz announced that all offices of Bahria Town Lahore will have Malik Riaz’s personal contact number and email address pinned on the notice board from April 27, 2016 onwards. He also requested complainants to mention their contact numbers in the applications written directly to him. As mobile phones and digital devices were not allowed in the hall, we do not have images of this meeting. If you want to express your thoughts on this, please leave a comment below.